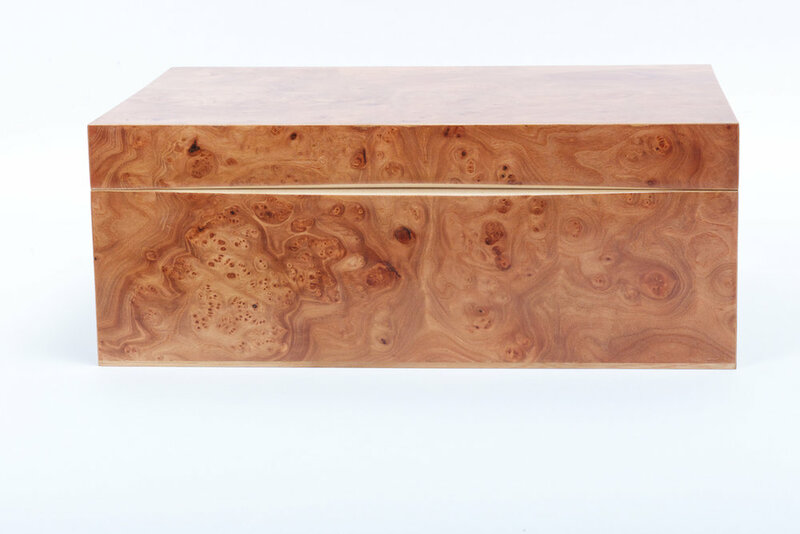 Materials: English rippled sycamore, burr elm and cigar box cedar lining. Beautiful hand-made humidor designed to reflect the many layers of tobacco leaves used in cigar construction. The dark swirling, almost smokey, exterior made of burr elm, is punctuated by a light textured interior of solid rippled sycamore when opened. A hand cut-curve on the front provides a contrast, inviting you to take a closer look, open and explore. The humidor compartment is lined with cigar box cedar, with a ventilation divide designed to hold a crystal humidifier which maintains a relative humidity of 70%. A separate compartment with leather lined trays, is designed to store cigar accessories, including lighter and cutter. A solid elm burr handle, brings the exterior texture into the light interior creating harmony in the design.